Vladimir Nabokov [vlah-DEE-mir nah-BOA-kov], 1899-1977; novelist, poet, scholar, translator, and lepidopterist. 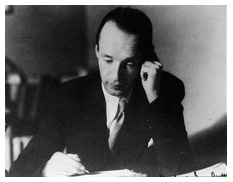 A cosmopolitan Russian-born �migr� whose linguistic facility, erudite style, and eloquent prose helped to establish him as one of the most brilliant and respected literary figures of the 20th century, Nabokov produced literature and scholarship of beauty, complexity, and inventiveness in both Russian and English. 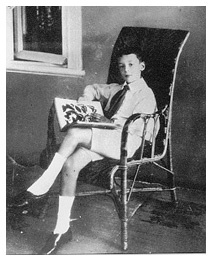 Describing himself as "a perfectly normal trilingual child in a family with a large library," VN first learned English and then French from various governesses; his father, upon realizing that his son could read and write English but not Russian, employed an instructor from a local school to teach VN and his brother Sergei their native tongue. The Nabokov family habitually spoke a melange of French, English, and Russian in their household, and this linguistic diversity would play a prominent role in VN's development as an artist. A slender but active youth, VN bicycled, played tennis and soccer, and, most especially, spent hours in and around the Vyra estate collecting butterflies. "My pleasures are the most intense known to man: writing and butterfly hunting," he would later say, and his pursuit of butterflies was not merely a pleasure, but a passion that would influence his life and art, both overtly and stylistically. A series of tutors helped to provide a diverse education. In particular, the study of drawing and painting sharpened his powers of observation and imagination. A description of his colored pencils from the memoir, Speak, Memory, is evocative: "The white one alone, that lanky albino among pencils, kept its original length, or at least did so until I discovered that, far from being a fraud leaving no mark on the page, it was the ideal implement since I could imagine whatever I wished while I scrawled." VN entered the Tenishev School in St. Petersburg in 1910. The Tenishev School was the most advanced and expensive school in Russia, but even among its elite student body, VN was aloof, iconoclastic, even haughty, to students and faculty alike. That he was driven to school each day in the family Benz or Wolseley increased the sense of imperious individualism; only his soccer skill won him the social acceptance of his classmates. On the soccer field, VN habitually played goalie, so that, even in a team environment, he functioned alone. In 1916, his uncle "Ruka" bequeathed VN approximately two million dollars and a large estate. Such personal wealth reinforced his noble bearing and independence, and enabled him to privately publish a 500-printing run of a book of poems. Nabokovs' childhood was full and rewarding. He was adored by his parents, and through his family had experienced stability, love, and wealth; his position, heritage, and developing literary gifts suggested a bright future. Remarkably, his childhood seems even to have prepared him for the severe manner in which he passed from it; the Russian Revolution deprived VN of his birthright, but inscribed upon his memory his inheritance of Russian culture. 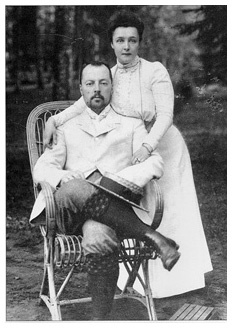 In November 1917, the Nabokov family left St. Petersburg for a friend's estate near Yalta, in the Crimea, in the wake of revolutionary rioting and the March 15 abdication of Tsar Nicholas II. His father accepted a position in the provisional government, but, after being imprisoned by Bolshevik forces, left St. Petersburg to join his family in the Crimea. The Nabokovs remained there for 18 months; VN undertook several butterfly safaris, capturing some 77 species of butterfly and more than 100 species of moth, which later formed the basis for his first scholarly publication, in the English journal The Entomologist in 1923. Fleeing the advance of the Red Army in April 1919, the Nabokovs traveled through Constantinople to England, where VN and his brother Sergei enrolled in Cambridge. VN originally studied ichthyology, but, fatigued by academia, he switched to French and Russian literature. Well served by his own heritage and courses from the Tenishev School, he coasted to graduation in 1922 despite disaffection with University life. VN spent little time in the Library, and seems to have easily passed exams aided by his literary extraction and meticulous lecture notes. He continued to play soccer, and had an active social life. He composed poetry in English, and completed a Russian translation of Lewis Carroll's Alice in Wonderland ("Not the first translation," he maintained, "but the best.") Carroll's precise, scientific background and zealous, sprightly paronomasia provide an interesting counterpart to VN's oeuvre. Indeed, Alice's signature elements of chess, playing cards, and a young girl in curious circumstances are themes that would occur and reoccur in VN's work. The Nabokov family had settled in Berlin, where VN's father became editor of the �migr� newspaper Rul' ("The Rudder.") In 1922, V.D. Nabokov was murdered by two right-wing assassins who were attempting to kill the politician Pavel Miliukov. The elder Nabokov leapt off of the stage in an effort to disarm one of the gunmen, was shot twice, and died instantly. His wife resettled in Prague, where she was offerred a government pension, and remained there until her death in 1939. 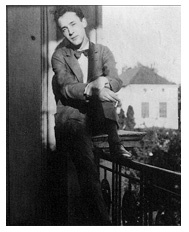 VN received his degree from Cambridge in 1922, and moved to Berlin, which had a large Russian population (the circulation of "The Rudder" was 40,000) He earned a tenuous living by publishing short fiction and poetry, using the pseudonym Vl. Sirin to avoid confusion with his father. He supplemented his income in a variety of ways: by giving lessons in English and tennis; translating; appearing as an extra in films; acting in theatrical productions; and by composing chess problems and the first Russian crossword puzzles. A lifelong insomniac with a dedication to his art, VN wrote mostly at night, which enabled him to lead an aloof but active social life in Berlin. He continued to play soccer, participated in several literary groups, and gave numerous readings of his works. On April 15th, 1925, he married fellow �migr� Véra Slonim. Their son Dmitri was born on May 10th, 1934. 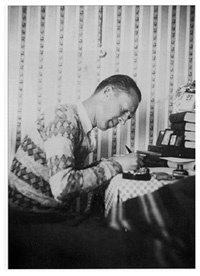 VN and Véra continued to eke out a living in Berlin; a steady stream of novels written in Russian appeared, from Mashen'ka (Mary) in 1925 to Dar (The Gift) in 1938. His body of work during this time was well-received by the �migr� audience and critics, but generated little income, and was largely unknown outside of the Russian-speaking population of Berlin and Paris. One consistent criticism of his fiction was its lack of "Russianness," that is, a lack of direct concern with Russia's issues and difficulties. VN would maintain, "I have never been interested in what is called the literature of social comment." In 1937, VN and his family left Berlin for Paris due to their disgust with the Nazi regime and Mrs. Nabokov's Jewish heritage. In Paris, VN continued to write in Russian, composed a few works in French, and also wrote his first novel in English, The Real Life of Sebastian Knight. He had determined that his most harmonious future lay in the English language; since England was not prepared to supply him with an academic appointment, the Nabokovs prepared to immigrate to America. The images on this page are from Vladimir Nabokov: A Pictorial Biography, compiled and edited by Ellendea Proffer (Ann Arbor: Ardis Publishers, c1991).